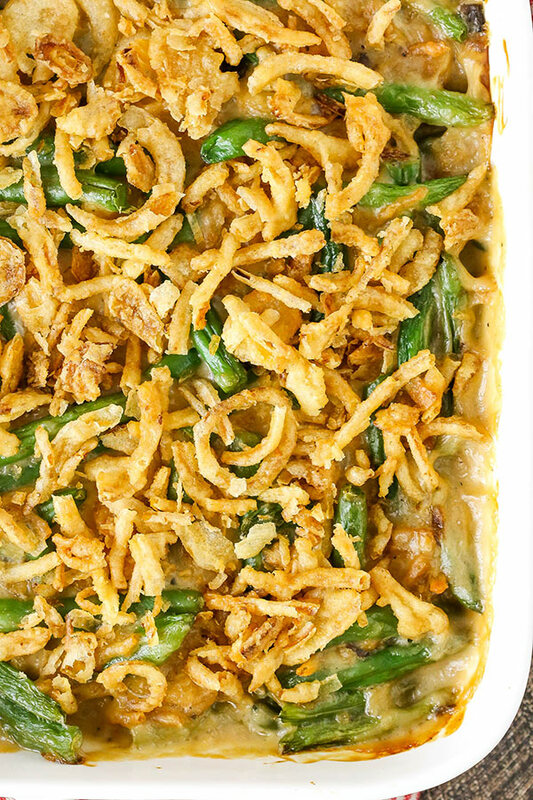 This Classic Green Bean Casserole is made with cream of mushroom soup, green beans, cheese, crispy fried onions and comes together in about 10 minutes! Such an easy classic that makes an appearance on our table at Thanksgiving and Christmas every year! Everyone has classics that they make for holiday meals and this is definitely one of mine. 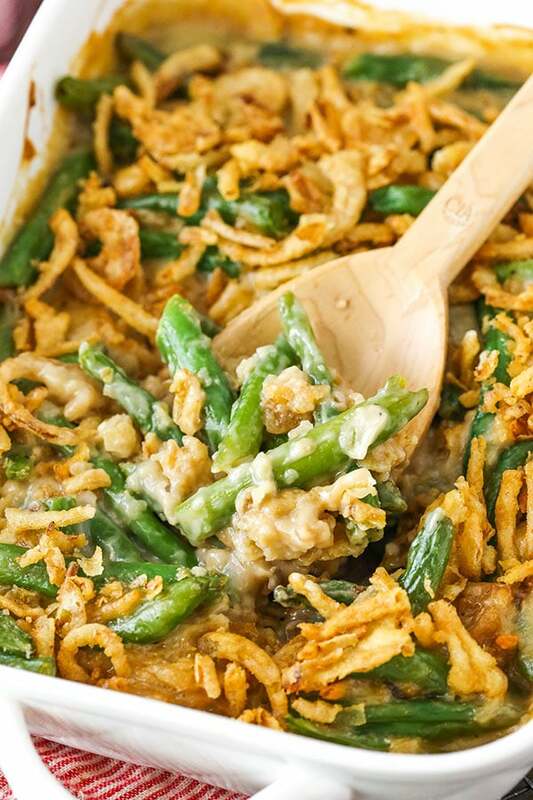 For me, the best green bean casserole is what I’ve been eating every year since I was a kid – the classic with cream of mushroom soup, green beans and crispy fried onions. Our secret ingredient to making it even better is a little trick my mom has always used – a little bit of soy sauce, worcestershire sauce and a dash of hot sauce. That extra bit of flavor really does make the best green bean casserole! 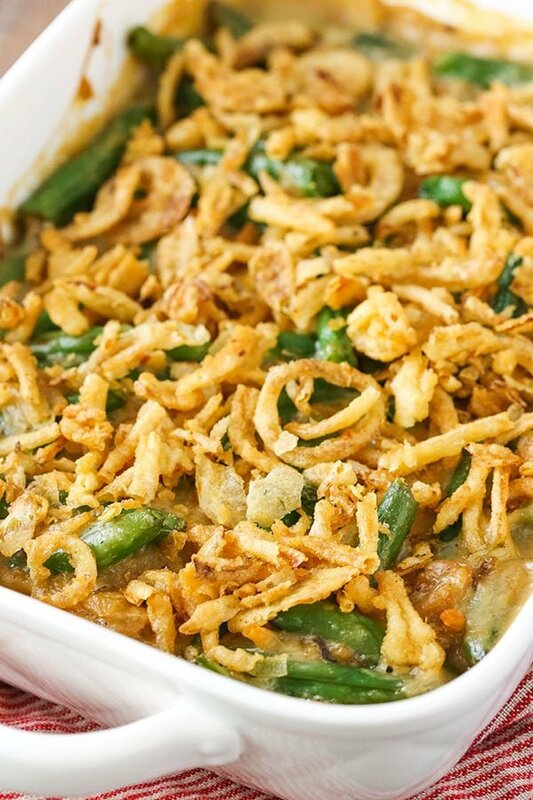 One of the great things about Green Bean Casserole is that you can really use whichever green bean is your preference. A holiday meal is a busy one with lots of prep, so you do whatever is best. Growing up, we mostly used canned green beans, although lately we’ve been using fresh green beans more and more. I played around with all three options in this casserole to really compare side-by-side and see what my favorite was. The winner was fresh! Canned green beans are the softest and tend to have the least flavor, whereas frozen green beans are the crunchiest and the strongest flavor. I loved the middle ground of the fresh green beans. Pre-cook them in the microwave for a few minutes to soften them up a bit and they are the perfect texture in the casserole. Plus, they have great flavor without taking over the other flavors in the casserole. Winner! How To Make Green Bean Casserole? The greatest thing about this casserole is that you truly just throw everything together and toss it into your baking dish. You’ll keep some of the crispy fried onions aside to add to the top, but otherwise it really is that simple. One element of the green bean casserole that I find important is the amount of milk. I don’t love a green bean casserole that is too soupy or soppy, so I like to have just enough milk without it being too much. I find that a fourth of a cup of milk is just right. Another great thing about this casserole is that you could totally prepare it ahead of time. Just add the crispy fried onions before you put it in the oven, so that they keep their texture. You have so much to prepare at the holidays, why not make life simpler and do some prep work ahead of time? 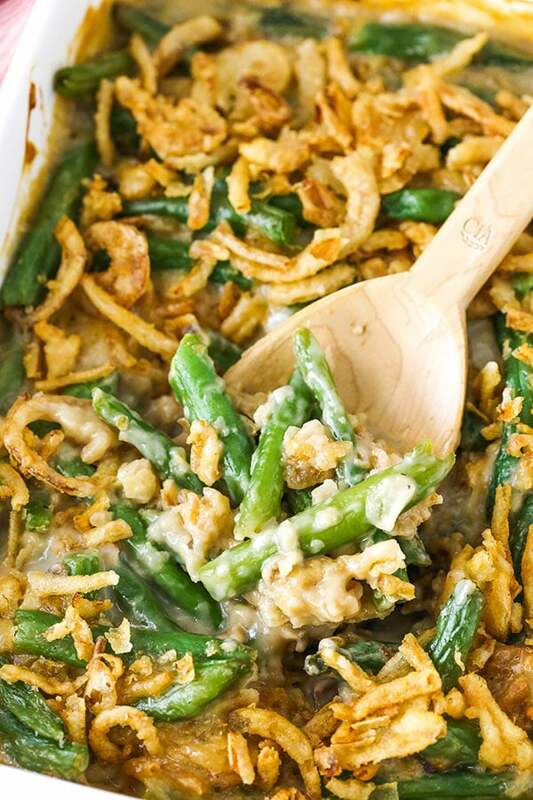 This Classic Green Bean Casserole is made with cream of mushroom soup, green beans, cheese, crispy fried onions and comes together in about 5 minutes! 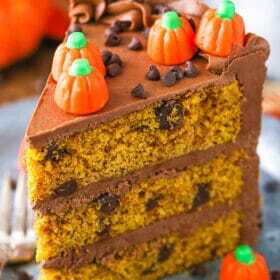 Such an easy classic that makes an appearance on our table at Thanksgiving and Christmas every year! 2. If using fresh green beans, trim the ends and put in a microwave safe bowl with about two tablespoons of water. Cover loosely with clear wrap and microwave for 5-7 minutes, or until they begin to get tender. Keep in mind that they’ll continue to cook in the oven. When done, cover the green beans in cold water to keep them from cooking more. 3. If using frozen green beans, microwave until thawed, then drain them. 4. If using canned green beans, drain them. 5. 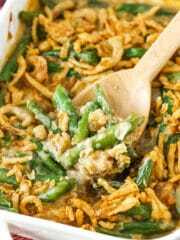 In a large bowl, combine the green beans, soup, milk, pepper, soy sauce, worcestershire sauce, hot sauce, cheddar cheese and 1 cup of crispy fried onions. 6. Pour the mixture into a 1 1/2 quart dish and bake for 25-30 minutes. 7. Top the casserole with the remaining crispy fried onions and bake for another 5 minutes, then serve. *Can use canned fresh or frozen green beans. If using canned, you’ll need two 14.5 oz cans. If using frozen, a 16 oz bag of green beans is about 5 cups. This sounds amazing! For some reason I can’t find the print button! Hmm, it wasn’t showing for some reason, but it is now. It’s just under the photo within the recipe card. Thanks Annie! My recipe has water chestnuts in it that gives it a little crunch and no cheese. I’ve never heard of putting cheese in it! Oh, fun! I haven’t ever heard of the water chestnuts. 🙂 Fun to hear all the little differences everyone has! The cheese is a more recent addition for me and I love the flavor and creaminess it adds – so good! What size pan should this be baked in? It’s a 1 1/2 quart dish. Mine is about a 9×7 size, but another shape or size would work as long as it holds roughly the same amount. 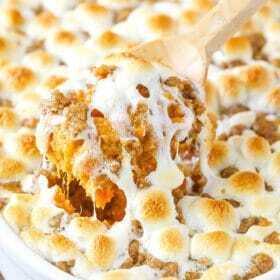 Can this be made the day ahead and then baked the day of thanksgiving? I made this and agree that I love the cheese in the casserole. I have used the soy sauce & Worcestershire sauce in it for years.